Privacy and defense against cyber attacks is priority one. Use your own raspberry Pi to build up powerful and secure openVPN server. Just connect from anywhere (free public WiFi networks, hotel room etc.) and use advantages of virtual private network (VPN) for free. By using your own openVPN server, Internet browsing stays encrypted and secure. Almost everybody wants to stay connected and “to be online”. For that purpose there are almost everywhere WiFi networks which can be used for free but usually they have one big disadvantage – NO ENCRYPTION. It means data which are transmitted/received are visible for everybody. It is great opportunity for hackers to intercept traffic and use it in their profits. By following simple steps you can set-up your own OpenVPN (located at home or workplace) which can be used as encryption endpoint. This will make your computer think it’s actually on your home network, even when you may be miles away. All network traffic is encrypted and sent to and from the VPN server, stopping would-be hackers in their tracks. We tried to prepare our tutorial as simple as possible with many details. In our scenario we used well-known raspberry Pi, credit card-sized single-board computer. B) To connect to your home network so you can access your web-camera, IPTV, router etc. In that case you have two options, please follow option A) or option B). It is not required to follow both. It will take some time, please be patient. First you will update your repositories and make upgrade of all currently installed packages. By second command you will install openVPN package. For generating certificates we will use easy-rsa. 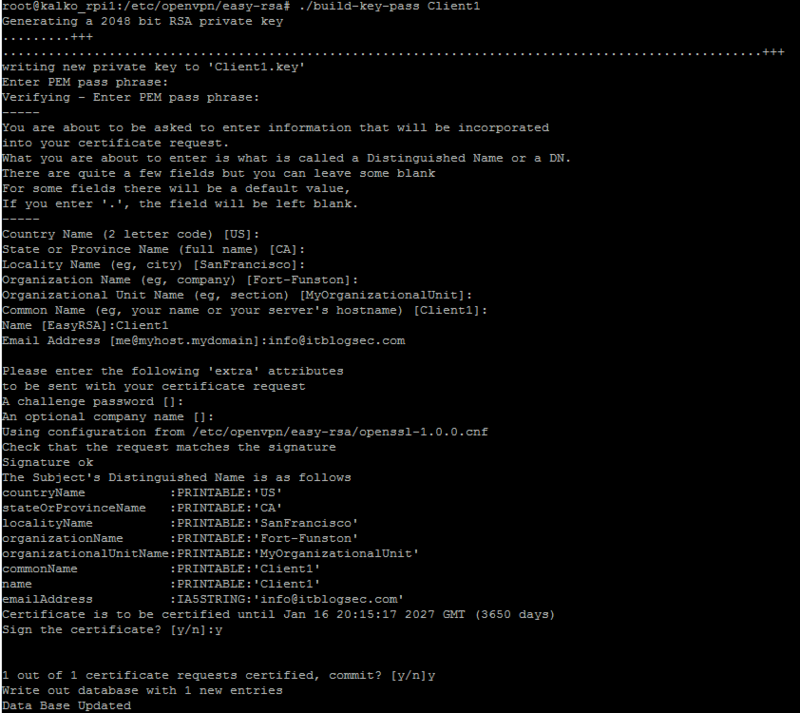 It is a CLI utility to build and manage a PKI CA. 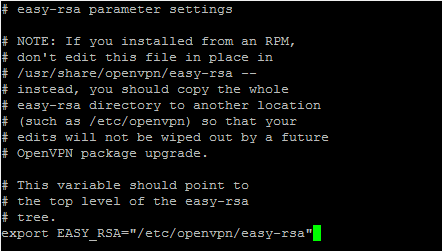 It is able to create a root certificate authority, and request and sign certificates, including sub-CAs and certificate revocation lists (CRL).In older versions there was needed to installs easy-rsa separately but currently easy-rsa package is already included in openVPN dependencies (version used in tutorial: OpenVPN 2.3.4). In the same file, just scrolling down, double check what KEY SIZE is currently defined. In the newest version there is value of 2048 by default. In case there is value lower than 2048, increase it to 2048. It will definitely increase security. 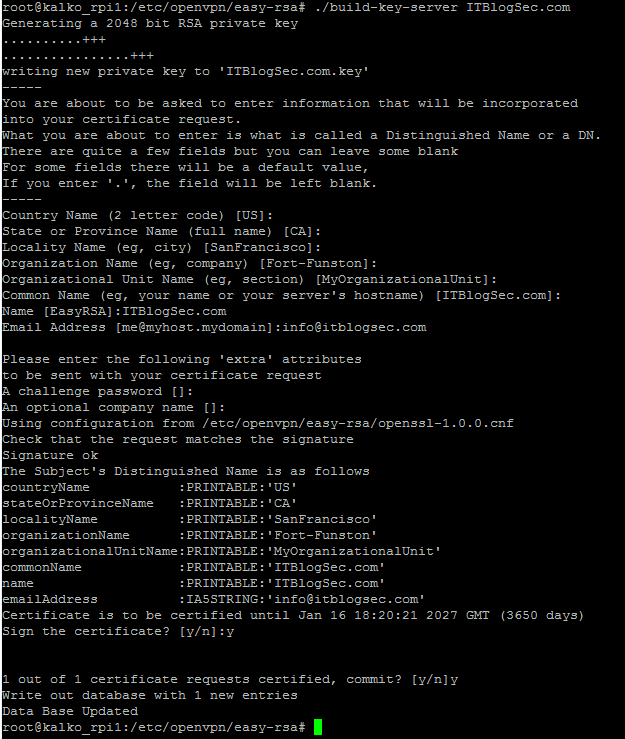 Now, build your encryption certificates, type exact commands as mentioned below. By this step you successfully created certificate for your openVPN server named ITBlogSec.com. The most important part of this step is attribute “commonName”, here name has to exactly match with name you entered in previous step. In that part we will create certificates for all our clients. Beware that you can generate only one client certificate and import to many clients but in this case only one client would be able to connect at a time. Therefore is recommended to create certificate for each client. Fill in all fields as described below, of course you can use your information. For “PEM pass phrase” use your own password. This password must be entered every time Client1 is connecting to server. For “A challenge password” must be left blank. Now we’re going to change the keys to different encryption scheme. I would recommend to use AES-256-CBC. It is time to generate Diffie-Hellman keys for your server. It will allow to exchange keys via public internet. If you want to understand in details, please check YouTube video here. Issuing command will take some time, apx. 15 min, so please be patient. By this part you will make basic configuration of your openVPN server based on our requirements. proto udp  #Some people prefer to use tcp. Don't change it if you don't know. push "dhcp-option DNS 192.168.1.1" # This should match your router's IP address. 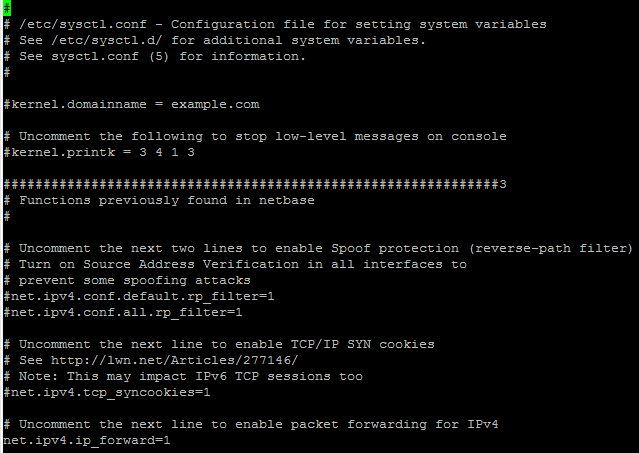 Finally, we’re going to implement OpenVPN’s build-in Denial of Service (DoS) attack protection. You might already know that a DoS attack is successful when a hacker finds out your server’s address, and generates such a large number of access requests that your server crashes. This article is about building proper iptable rules and how to make iptable configurations to load on every reboot. I have been trying to find a consistent and easy solution to implement iptables on Raspberry Pi (Raspbian-wheezy), the way Debian and Raspbian works does not provide a way to load iptables on every boot, it needs to be added manually as a script to load on start-up. There are ways to make Raspbian work without the instructions below, although the following – I think – are very simple and elegant. On the menu, select Yes on the rule.v4 file. The second choice is about rule.v6 and IPv6 support, choose based on your needs. If you successfully followed all steps above, congratulations! Your openVPN server is ready. Please follow our next article (Part2/2) where will be mentioned exact steps how to import certificates to the client and how to establish VPN tunnel successfully.